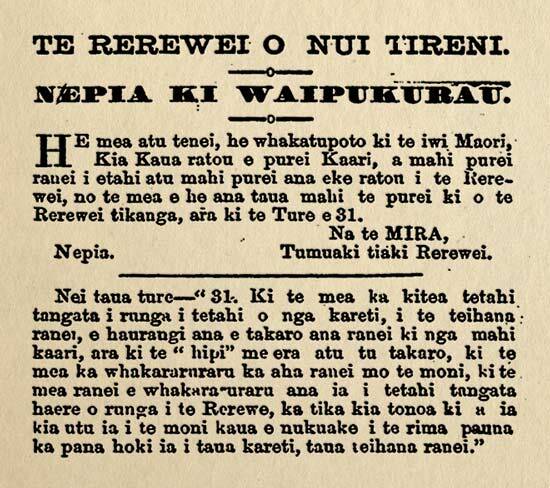 'Kia Kaua ratou e purei Kaari ... ana eke ratou i te Rerewei' ('You are forbidden to play cards ... while on Railway property') warns this notice in an 1878 issue of the Māori-language newspaper Te Wananga. Passengers are warned against playing cards on the Napier–Waipukurau line, and reminded that this is illegal under Rule 31 of the railway regulations. The regulation, and this public notice, suggests that card playing was widespread among both Māori and Pākehā, and that authorities were concerned to limit it – perhaps to avoid disorder and gambling.